He may talk slower, but don't discount him, because of his frail appearance. Judge him, and what his team, some of whom have pretty decent credentials can offer. 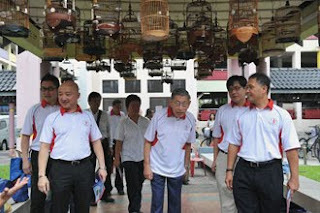 Bishan need a change after 24 years perhaps under DPM Wong Kan Seng? Surely 5 years w/o upgrading isnt much a BIG DEAL there? 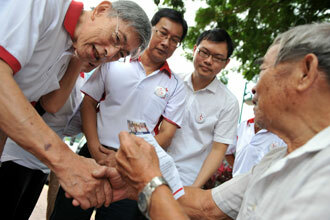 Opposition veteran Chiam See Tong, 76, says doctors have given him the go-ahead to stand for elections. Since a stroke in 2008, his posture is stooped and his movement slower but, in an interview yesterday, he said he exercises regularly, goes for walkabouts at least weekly and is ready for campaign action. VETERAN opposition leader Chiam See Tong has been given the green light by his doctors to do battle at the next general election. But the 76-year-old, a stroke victim, accepts that he could face another medical condition in the coming years: Parkinson's syndrome. He revealed yesterday that he is fending it off by exercising regularly and taking medication to delay its onset. Once a week, a fitness trainer comes to his home in Bukit Timah to strengthen his muscles. He rides an exercise bike for half an hour each day and swims regularly. Said his wife Lina Chiam, 62: 'Strokes lead to Parkinson's. But how do you go about it? Do you wait for it? The couple spoke candidly to The Straits Times about his health, showing no signs of being dispirited. Indeed, Mr Chiam is optimistic about his health, saying he has kept going because of his confidence in his own body. 'I have a feeling I will get well, this is something which is a passing phase. So I didn't bother to stop doing politics,' he said. A person with Parkinson's syndrome displays the symptoms of someone with Parkinson's disease but does not have the nerve disorder. The symptoms include having a stooped posture and slower movements. Doctors The Straits Times spoke to said a stroke in the same area of the brain that is affected by Parkinson's disease can cause the syndrome. During the near two-hour interview, the Chiams stressed that the long-serving MP who suffered a stroke in 2008 has what it takes to go one more round. 'He went to see doctors. Doctors did not advise him not to stand for election, they just leave it to him,' said Mrs Chiam. He was a school swimmer while at Anglo-Chinese School and an avid badminton player in university. As Mr Chiam steps up his public appearances as election fewer heats up, his frail physique and hunched posture have come under the media spotlight, prompting questions on whether he is fit enough to mount a proper election bid. Others have suggested that he should have stepped away from politics on a high, after winning in single-seat Potong Pasir at the 2006 polls. Mr Chiam plans to lead a five-member team to contest the Bishan-Toa Payoh GRC while his wife is taking over the reins in Potong Pasir. In shrugging off the doubters' comments, Mr Chiam showed a mind that was still sharp and lucid. He did not stop after his stroke in 2008 because 'I seriously think I can contribute like any ordinary person'. In fact, two weeks after the stroke, he was on his feet again, seeing to the needs of his constituents at his MPS. He acknowledged his health has affected his work, 'but I don't let it bother me'. In recent weeks, Mr Chiam has been showing just how much fight he still has in him. During a walkabout in Thomson a month ago, he walked up a flight of about 30 steps unassisted. Since then, he has gone on walkabouts at least once a week, often staying on his feet for up to three hours. Ratna Suffian’s 84th header may have won the game for Hougang United but it was the name of teammate Fadhil Salim that Cheetah fans were chanting at the end of the game as the home side defeated the visiting Albirex Niigata (Singapore) side on Monday night by a solitary goal. Indeed, the Hougang custodian was kept busy by the visitors right from the start. He showed good reflexes to deny a goalbound shot by Tatsuro Inui in the 11th minute as a quick freekick allowed the Albirex dangerman in. Six minutes later, he went one better by pulling off a double save. Inui’s curling freekick was punched clear and the follow up header by Keisuke Matsui was again thwarted by Fadhil. Albirex fans were left disappointed yet again in the 27th minute as the Hougang custodian once again got down well to his right to stop Inui’s freekick attempt. Four minutes before the break saw Fadhil pulled off what was probably his best save of the night. Again, Inui was in the thick of action as he laid a quick pass into the danger area to striker Shotaro Ihata, whose left foot volley brought out a stupendous save from the Cheetahs’ keeper. Though they were outplayed for most of the first period, Aide’s men continued to stay focused and displayed a high level of concentration in their defensive duties. They never really tested Yoshito Matsushita’s goal in the first period other than a freekick attempt by Argentinian Carlos Delgado which required the keeper’s intervention. Other than that, the only danger the Japanese side encountered was the occasional counter attacks which relied largely on the pace of Mamadou Diallo and Jordan Webb. Albirex continued their pressure on the Hougang goal early in the second period. A flowing move in the 49th minute involving Inui, Ihata then saw teammate Yosuke Saito’s deflected shot off a defender almost loop into goal, only to be denied by a back-pedalling Fadhil who got his fingertips to the ball. Aided by Fadhil’s inspiring performance, the Hougang boys began to up their performances. Diallo tried to lift the spirits of the home crowd with a chip from 35 metres out in the 57th minute but to no avail. Just as the Cheetahs were beginning to stamp more authority on the game, defender Syaqir Sulaiman’s two moments of madness almost caused his team. He had just gotten a caution in the 73th minute for a late tackle before another rash challenge, which looked like a slap on Inui, saw him got receive a straight red from the referee. There was much debate as to where the second offence took place but referee W.Ravisanthiran only awarded a freekick on the edge of the box, much to the frustration of the Albirex bench. A smart save off the resulting setpiece situation and another from substitute Bruno Castanheira’s in the 80th minute ensured Fadhil was the undoubted man-of-the-match. Then, the moment the suffering Hougang fans had been waiting for came. Delgado swung in a freekick into the danger zone and Ratna got the decisive touch which left Matsushita gasping in mid-air. Hougang was rocking. Led by Ratna and captain Shariff Samat at the back, the Cheetahs gallantly guarded their lead for the rest of the game to clinched full points. Speaking to the sleague.com crew after the game, Aide was clearly delighted with his side’s overall performance. “If they can put up this kind of performance defensively as a team, I think we will be able to get a few more good results”, he added. Despite the praise he had for Fadhil, the former national skipper did acknowledge that consistency has been a problem for his man and is something he has to help him with. On the other end, the Albirex players were visibly gutted out by the result and perhaps all the more with the men in black. White Swans’ coach Koichi Sugiyama said, “We prayed that we do not need to say anything against the referees this season. “We wanted to be patient. But this is very regrettable”, he said in an unusually serious tone, while declining to elaborate further. Despite the setback, credit must go to Coach Sugiyama as he got his troops back on the field to shake hands with their opponents, just as his charges were heading back to the dressing room in utter disappointment. -I thought SAF would win and they did. Indra is king but supposed absence of Qiu Li was crucial. -Tampines come back, yet again, against Etoile. Again it was 2-1. -Nagatomo started his first game for Inter. -Roma reignite their European chase at Udine despite being underpressure for much of 1H. 90th minute winner from Totti. -Los Che whacks the hell out of a european overdosed Villarreal. Yellow submarines were never in the game. The UCL earlier in the week were mostly a no-brainer but not having a stronger will to participate in the action was the only sore point. Well looks like El Classico will play out a record no. of times this season. My Barca is defintely a shoo-in for La Liga, but i won't be surprise if Jose has something to show when he gets a another shot against his rivals. He's good at knockouts. But the man usually takes 2 seasons to whip up his team into contention of European glory, but the strong base of Real initially might shorten that time frame needed? Im sure he would have seen the 5-0 demolition more than 100 times, with that being his biggest defeat to his biggest rivals. Fireworks expected. Jalan Besar Stadium was turned into a mini-Japan on Saturday evening as the local Japanese community turned out in force for the sell-out charity game between the S.League All-Stars and an Albirex Niigata Selection (ANS) side in aid for the recent disasters in north-eastern Japan. The entertaining game was played in friendly spirit and ultimately ended 7-2 in favour of ANS. Amongst the goalscorers was FAS President - Mayor Zainudin Nordin and a 14-year old local boy by the name of Deen Martin. Albirex Singapore’s chairman Daisuke Korenaga also made a cameo appearance late in the game along a major Japanese donor who was unnamed. Sources sleague.com spoke to revealed that the young boy is actually an orphan under the Muslimin Trust Fund Association who had been kindly sponsored by media company Comm Pte Ltd. In the buildup to the game, three former Japan internationals – Hidetoshi Nakata, Masaaki Sawanobori and Masakiyo Maezono had been announced to the part of the ANS team. Joining them in the team on match day was another ex-Blue Samurai, 43-year old Tsuyoshi Kitazawa, who promptly started the game along Sawanobori. The technique of both men was evident and together with the trickiness and pace of compatriots Bruno Castanheira and Tatsuro Inui, caused the All-Stars side plenty of problems in the first period. The opening goal of the game came courtesy of Inui’s lob in the 10th minute, after All-Stars keeper Shahril Jantan had blocked Castanheira’s initial attempt. All 11 players of ANS then got together to dedicate the goal to those who had lost their lives in the recent events. Richard Bok’s All-Stars team had Vitor Borges and Fazrul Nawaz upfront from kickoff. The latter seemed to be in determined mood, possibly trying to prove himself in front of national coach Raddy Avramovic who was in the stand, after the Serb’s recent comments regarding the progress of the national forward. Fazrul did well in a number of occasions in the first half and it was his blocked shot which led to the corner that resulted in his team’s equalizer. From the uncleared setpiece, Carlos Delgado’s centre was met by Obadin Aikhena’s glancing header to tie the game up on 20 minutes. In the 28th minute, ANS was awarded a spot-kick after Afiq Yunos’ foul on Castanheira. However, Shahril got down smartly to parry Sawanobori’s attempt. The SAFFC custodian was then accidently hurt in the ensuing rebound and had to be replaced by Izwan Mahmud soon after as a precautionary measure. Eight minutes later, the Albirex Singapore connection worked wonders for the Selection team as Shimpei Sakurada and Inui sliced the All-Stars’ defence open for Castanheira to score. This time round, the players ran towards the bench and celebrated together in a sign of solidarity. The All-Stars then stepped uo their performance but hesistant defending on the stroke of halftime allowed Kazuki Kobayashi to make it 3-1. The second period saw the introductions of Nakata and Maezono amongst others while Richard made ten changes to his side. As the All-Stars were still finding their feet, ANS’ Shotaro Ihata notched the fourth for his side despite Izwan’s best efforts. Then in the 62th minute, the volume at Jalan Besar upped a notch as Nakata got his name on the scoresheet from a half volley after good work by Ihata to make it 5-1. The former golden boy of Asian football showed glimpses of his glory days, as even showed a couple of backflicks to keep the fans entertained during his 45 minutes on the field. On the All-Stars’ front, Jordan Webb unleashed some skills of his own – something he had promised the author the day earlier, as a couple of stepovers on the counter attack drew a freekick which Frenchman Hicham Bouchemlal took but could only find the side-netting. With his side looking for some consolation goals, captain Paul Cunningham was pushing on from his defensive position to initiate a few moves but without much success. The sixth and seventh goal for ANS for the evening then came late from the young Dean Martin. His first came from the penalty spot which Izwan never really moved and the second came after Nakata himself and put in a cross from the right. In his short cameo, Deen was also flagged offside twice by the ever serious linesman, which denied the boy a clean run towards goal, as all on the ANS bench stood up and “complained” in disbelief to the official. Between Deen’s two goals, the All-Stars hit the woodwork twice in quick succession through Webb and Mayor Zainudin. However, the Mayor was not to be denied as the ANS defence half cleared the ball nicely to the path of Mr Zainudin who finished off a left-foot grounder to add to the All-Stars’ account for the evening. ANS and Tampines' Japanese international, Akihiro Nakamura, himself a seasoned campaigner in the league said, “We cannot do big things, but we can play then people come and donate which is good for Japan.” His compatriot beside him, Home’s Kenji Arai, nodded in agreement. With regards to the eventual scoreline, Hariss commented, “There were no crunching tackles. We played to have fun, to let the goals flow. You could see that with the little boy scoring.“Most importantly, we all had good fun and a good laugh”. A replica Japan flag, with the message, “We will never walk alone” was unleashed at the final whistle by chairman Korenaga. Hopefully the recent efforts of the FAS, S.League, TAKE ACTION Foundation, Albirex Niigata (Singapore) and the local community would have communicated this message across.